The SGS3 takes the timeless elegance of the "Black Beauty" and applies it to the iconic SG body style to create a stunning homage to this early-'60s rocker. 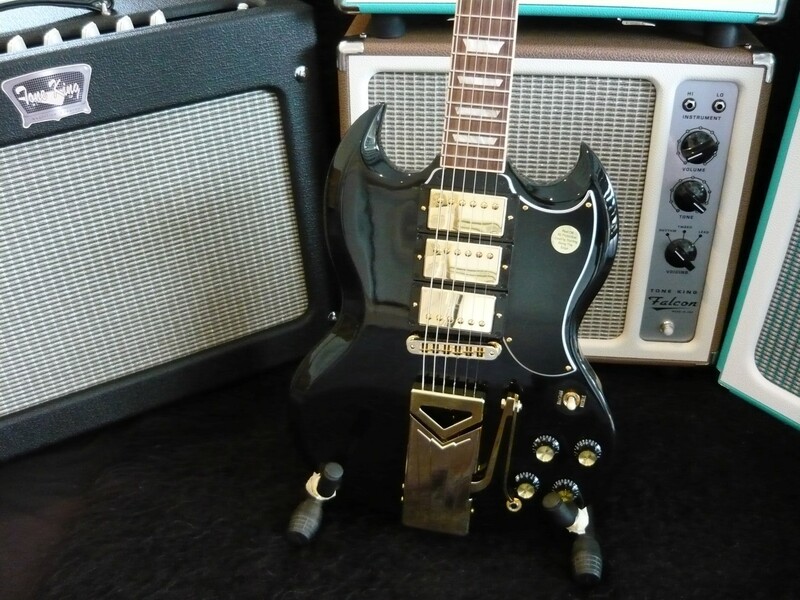 The classic SG body is crafted from solid mahogany, with asymmetrical pointed horns and a beveled edge for comfort, and looks absolutely killer in Ebony nitro with 5-ply black pickguard and black Top-Hat knobs. Gold-plated hardware—including a vintage-style Sideways Vibrola updated for improved performance—completes the Custom look, while three of Gibson's popular '57 Classic humbuckers ensure unparalleled tone. The glued-in mahogany neck has a SlimTaper profile for that fast, slick playing feel that rockers have come to know and love, with a bound one-piece rosewood fingerboard with acrylic trapezoid inlays. Protect it in a Vintage Brown hardshell case from gig to gig, and you're ready to rock out in grand style.